If your older family member is admitted to the hospital for an illness or surgery, do you know your care and rehab options once they are discharged? Even after a hip replacement, an elderly patient may stay in the hospital only three or four days, depending on their progress. It is so important to work with the appropriate hospital staff, such as a case worker or discharge planner, quickly to determine the best rehabilitation option to recuperate and prevent a readmission. The hospital staff can help you understand the level of skilled care and services needed for their rehabilitation. Research shows that between 15-20% of patients, who are discharged from the hospital, will be readmitted with 30 days or less. Often times, these readmissions could be preventable. It is important to understand the three primary options of where your family member can be cared for after a hospital stay and what is the best fit for your situation. If your loved one requires round-the-clock monitoring and skilled nursing care after a hospital stay, then moving them into a skilled nursing facility is necessary. If your loved one is suffering from a debilitating medical problem and require constant aftercare and treatment, their doctor may order inpatient services for their acute medical condition. Skilled nursery facilities can feel clinical and most patients will share a room. If your loved one needs part time or intermittent services, a licensed medical professional can be scheduled to visit the home. The success of home health services depends on the support system of their living situation. Getting plenty of rest in a familiar environment can be good for recuperation. But if a patient is living alone, they may feel isolated. Rehabilitation exercises may need to be done independently and require the patient to be self-motivated. If you feel as though your loved one is too unstable or weak to live alone and there are no family members who can care for them, then home services may not be the best fit. Many families are unaware that assisted living communities offer short term stays for patients released from the hospital to to live while they recuperate. Assisted living communities can offer nursing care, therapy services, and 24-hour care staff in a homey environment. Basic needs like the activities of daily living, such as getting dressed, making meals and bathing, can greatly reduce stress for both the patient and family members. Most communities can provide transportation to and from doctor and therapy appointments. 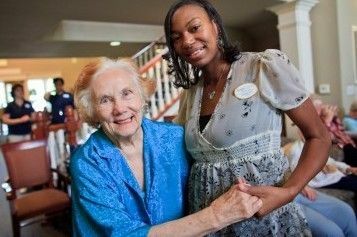 Assisted living communities provide peer support, activities, and socialization that aid in healing and mental well-being. Many times, a patient will enjoy the community and opt to stay as a permanent resident. In the case of an emergency hospital stay, Aegis Living has recently launched a new public service, the Red Crisis File. A member of the Aegis team will walk a caregiver or family members through a checklist to gather the state required documentation needed to move a loved one into a respite stay, assisted living, or memory care. This is a free service that can be completed before an emergency for peace of mind. Contact an Aegis Living community today to be prepared in the case of an emergency, such as a hospital stay.